The SofLens Multi-Focal Contact Lens may be prescribed for frequent/planned replacement or disposable wear. If you thought presbyopia and the loss of your reading vision meant the end of contact lenses, think again. 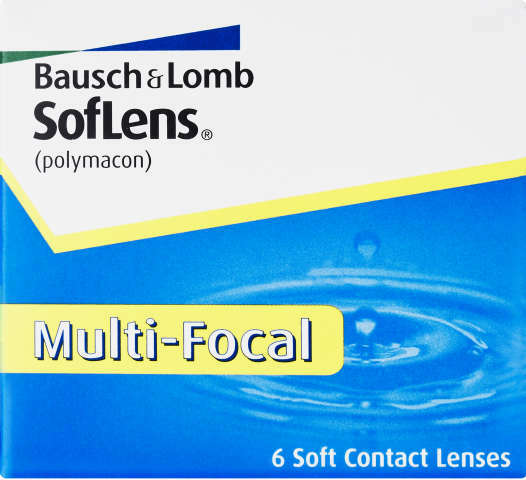 Bausch & Lomb SofLens Multi-Focal contact lenses enable you to see well at all distances. The unique Natra-Sight™ Optics enable easy transitions across near, far, and all points in between, and a patented edge design provides all day comfort. Results from a clinical study show SofLens Multi-Focal contact lenses were patient-preferred 2 to 1 over a leading bifocal contact lens for overall visual quality. Wear on a daily basis and replace every two weeks. 6 visibly tinted lenses immersed in a phosphate buffered saline solution.